Planning education reaches far beyond the classroom. As practicing planners, we need to make sure that residents, business leaders, and city councillors understand planning concepts such as the need for increased density in urban corridors, growth management strategies and travel demand management. In this post, I’m going to introduce some videos that introduce people to planning concepts and issues. Our amazing Dalhousie School of Planning alumni, Byung-Jun Kang and Uytae Lee, produced this video in partnership with the Licensed Professional Planners Association of Nova Scotia. It gives beginners a brief glimpse into the field of planning, and might be useful for conversations and presentations to the general public. We also use it on our School of Planning website to help potential students understand what kinds of work they will do when they graduate from our programs. My colleagues on the HOUWEL project at the University of Amsterdam produced these videos on housing choice among young adults as part of their five-year study of housing markets and welfare state transformations (2012-2017). There are three in the series, and they use simple animation to illustrate declining ownership and limited wealth transfer trends among young adults. These would be useful in conversations about the need for different housing types, affordable housing options, or changing demographic trends in international cities–although they may be less useful for countries without a solid history of social welfare and public housing. These are great examples of research dissemination for those of us developing grant applications that incorporate knowledge transfer strategies. For students interested in Indigenous housing or engagement issues, this CBC News video profiles Ryerson University planning professor Shelagh McCartney and her students, who travelled to Nibinamik, a First Nations community. Their goal was to help the residents envision new housing to replace the substandard units that were built after a fire destroyed the original log homes built by the founding members. The piece focuses on the lack of cultural sensitivity in designing homes that reflect the needs of the people, but I would argue that there is a lot to be discussed in terms of the type of consultation used during this project, the role of governments, and the lack of a planning framework in which to situate the project. As a journalistic piece, it definitely takes an editorial stance on this complex issue. My friend Sarah Church, a Postdoctoral researcher in the Department of Forestry and Natural Resources at Purdue University, recently produced a video on water quality featuring interviews with farmers, local residents, and water quality experts in Indiana. Common Ground, Common Water is great primer on why we need to protect drinking water and aquifers, and shows examples of rain gardens and bioswales for those who are new to this area. I’m teaching an introduction to planning this fall and might use this resource during the week on environmental planning. It’s another example of research dissemination for faculty members. 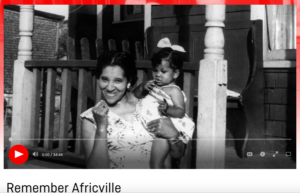 I love using Remember Africville (1991), a 35-minute National Film Board piece that documents the destruction of a historic African Canadian neighbourhood in Halifax in the early 1960s. Featuring gut-wrenching testimonies from Africville residents from the 1980s and TV interviews with contemporary planners and city mayors, the film portrays the systemic racism that contributed to residents having little say in the demolition of their homes, church, and community and their forced relocation to newly built public housing. This year I paired this bleak film with Mulgrave Park (1961), a 12-minute promotional film made by the NFB and Canada Mortgage and Housing Corporation that demonstrates the hilarious optimism of the federal-provincial public housing projects that supposedly replaced Africville and other low-income neighbourhoods. It’s often more difficult to find videos related to social planning or equity approaches to comprehensive planning. The One Baltimore approach is a unique example of applying an equity lens to the planning process. Incorporating resident ambassadors who worked to gather feedback within their own communities, a team lead for each city district, and consultation with 25 community groups, Baltimore’s Sustainability Plan revision process is a model for inclusion and addressing systemic inequities among African American communities. Interviews with the resident ambassadors are particularly inspiring. The video would be useful in a class on community engagement, or a theory class on participatory or collaborative planning processes. The Nova Scotia Health Authority’s Mobile Food Market video explains their pilot project to deliver fresh fruits and vegetables to underserved, low-income areas in the Halifax Regional District. I used it in a class on environmental justice, where we discussed the lack of shops and services in neighbourhoods with low-income or visible minority populations. Understanding that changing existing zoning can take a long time, mobile services like this present a quick, though temporary, fix. There are a lot of great videos out there profiling interesting, challenging, and controversial projects, programs, and strategies. I’ve found that using these videos brings the issues to life and provokes strong feelings in the students–this term my students have channelled that energy into brief in-class written responses. These videos are useful in undergraduate teaching where students are still learning about planning practice and thinking about where they want to work in the future. But they’re also appropriate for members of the public (our friends, community and family members) for whom planning is a mystery!